ISS043E122200 (04/17/2015) — The SpaceX Dragon cargo spacecraft is seen approaching the International Space Station Apr. 17th, 2015. NASA astronaut Scott Kelly had some off-time today relaxing ahead of Sunday’s launch of the SpaceX CRS-7 mission. Cosmonauts Gennady Padalka and Mikhail Kornienko worked on Russian science and maintenance activities. 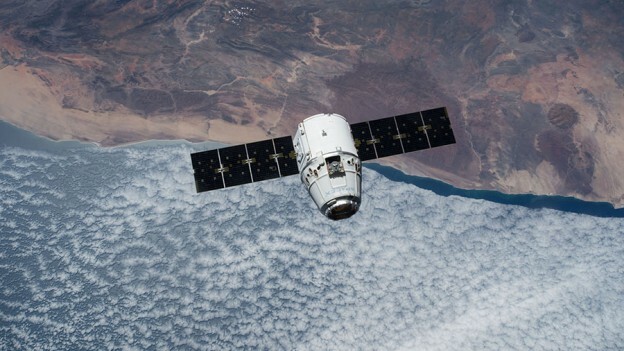 Kelly will be inside the cupola and at the controls of the Canadarm2 when the Dragon space freighter arrives Tuesday morning at the International Space Station. Padalka will back up Kelly monitoring systems as Dragon approaches. NASA TV will cover the Sunday launch and Tuesday capture activities live. Padalka spent time on the Splanh experiment studying how a crew member’s digestive system changes in microgravity. Kornienko worked throughout the station’s Russian segment inspecting gear, performing leak checks and working on life support systems. There is a 90 percent chance of favorable conditions for Sunday morning’s SpaceX Dragon launch from Cape Canaveral Air Force Station in Florida. Dragon is delivering over 4,000 pounds of supplies, gear and research in its pressurized section. The largest payload being delivered is the first of two international docking adapters in Dragon’s unpressurized section.